I lost a friend. None of us knew it would go so fast. Even Mary Louise. She had cancer — we all have cancer — and it had progressed — as cancer does. Over three years it had grown, then was beaten back by toxic chemicals. Mary Louise grew well again or at least she was better again. Although none of us is ever as good as we were before diagnosis. Then her leg became enflamed — red, hot, swollen. Even the infectious disease specialist could not identify the ailment. He prescribed an antibiotic and when the redness grew up her calf, he doubled the dose. And the next month, when the infection reached her thigh, he tripled the dose. We we had high hopes for a clinical trial that all three of us were on but Mary Louise wasn’t getting any better. She had a brief respite on yet another chemo therapy. When she missed the chocolate cake and sunflowers our group arranged just before her birthday, I knew something was wrong. She so enjoyed a celebration. She hadn’t eaten in days. She was sleeping all day. She was home alone. The infectious disease specialist had increased the antibiotics again but now her right ankle was red. When I drove her to hospital the next morning, neither of us knew she’d never see her apartment again. Looking back, it all went so quickly. Intravenous antibiotics. Fluids. Blood transfusion. A final CT scan. The talk with the oncologist. And then a couple of days for all of us to get used to the idea that Mary Louise was dying. As Mary Louise began to trust our little group she realized our questions were about caring, concern and gathering information. Some of us thrive on learning more about the disease we share — how many permutations, how it attacks us differently. What new drugs are being tested and will we qualify and will it work? Mary Louise learned to ask questions too and learned how much anger we shared. I miss her bold guffaws at our black humour. We were in a race that no one wanted to win. Could we slow it down? At the hospital, they told Mary Louise she would go to hospice soon. At first she was worried that she was too far from dying to go to hospice. No one lives much longer than a few months, they’d said. Wouldn’t she live longer? And what about home, she asked? “Can I go home again?” She wondered. She needed care. A hospital bed. Drugs to ease her way. Oxygen. She was reassured that hospice was the best place for her now. She need not have worried. Four days she lived in hospice and then she was gone. Johnny was a family friend who lived on a farm in Whonnock long ago, when the rural area was far from North Vancouver, accessible by narrow country roads. On Sunday, my dad’s day off, he often helped Johnny with concrete work and cutting down trees and planting new ones. There was always lots of laughter and many jokes between my dad and Johnny. In the late afternoon Phyllis would call us for Sunday dinner served on china plates with blue patterns of willow trees. I had never seen plates like that before. At home our plates were plain-coloured melmac with a 1960s trim of orange and brown around the rim. When we last saw Johnny he was in a four-bed ward of Vancouver General Hospital. I was too young to understand the significance of the last visit. I don’t even remember seeing Johnny but I remember my mother’s face when we left the darkness of the ward. Her face was drawn and she was upset. From his gaunt, skeletal face, she knew he was dying and no one had told her so. This is cancer’s last hurrah. No fundraising. No celebratory head shaving. I’ve seen real cancer now. A few months ago the four of us — ovarian cancer buddies — laughed over lunch. Some of it ghoulish humour. We are all facing death — some of us sooner than the rest but none of us really knows when. My friend K has been expecting to die for years or so the doctors have said. But she is still active and lively and eager to try another clinical trial if it fits. We do not look afraid at least not while we’re having lunch. My other friend, S, has just spent a month in hospital. At first we thought there was hope for recovery. But she’s had “the talk” we all fear. It’s when the oncologist says she is sorry but there is nothing more she can do. So S is home to enjoy her grandchildren and say goodbye to her family and friends. M was admitted to hospital this week. And we don’t know how long or whether it’s for good. We will wait and see. Only K and I can go for lunch now but she doesn’t eat much any more. My view of cancer is clouded by my own relative good health. “You look good,” people say. And now I know what they mean because I have seen what cancer looks like when it takes a hold of you and says no more Walks of Hope and no more Cancer Dances. Now it’s Snow White’s pale complexion, unbearable fatigue, veins shrunk and lost within a flabby arm. Frustration at the loss of movement and self control. Fear of infection taking over. The faint scent of urine leaks from the bathroom door left ajar by the last patient eager to empty his bladder after the CT scan. They leave the CT room wearing the short blue patient gown, strings tied haphazardly in front or back or on the side. Skinny legs and shoes below. Minutes later they emerge, dressed in jeans and a leather jacket — no more the patient, now the man. Or at least a patient disguised. On the cancer hospital floor the patients are easy to spot even if they’re wearing sweat pants and t-shirts. They’re linked to the chemo pumps by thin plastic tubes and the needle in their arm. One man is doing laps around the floor. Here cancer isn’t pink or teal ribbons. Or smiling faces like the bald runner on the poster for Back on Track Fitness. Here the bald heads are pale and sad, holding cardboard dishes on their laps in case vomiting resumes. Pain is a constant companion. With drugs to beat back the hurt. And drugs to stop the nausea. And drugs to keep the bowels moving. And drugs to sleep. And we wonder, how long are we here for? And will we see our home again? And is this the end? And if it is the end, how much more must we endure? Avastin has been available in the United States and the European Union as a co mbination treatment with chemotherapy for advanced ovarian cancer. For many women, Avastin has given them a longer life. In Canada we’ve considered Avastin one of the “last hope” drugs as its significant cost has not been covered by BC Pharmacare or the BC Cancer Agency. While some of my ovarian cancer friends have managed to use Avastin as part of their treatment, they’ve had to pay for it themselves — up to $5,000 per treatment — and they need it every three weeks. Some friendly extended health plans have covered the cost, sometimes sharing the bill with Avastin’s manufacturer, Roche Canada. Now that Health Canada has approved the use of Avastin, the next step is to have the pan-Canadian Oncology Drug Review approve funding for the use of the drug. 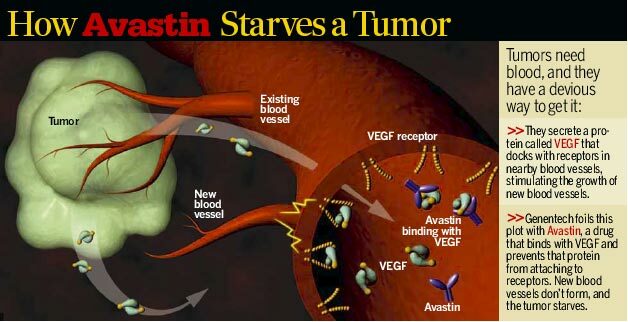 Avastin (bevacizumab) is a recombinant humanized monoclonal antibody that selectively binds to and neutralizes the biologic activity of human vascular endothelial growth factor (VEGF). 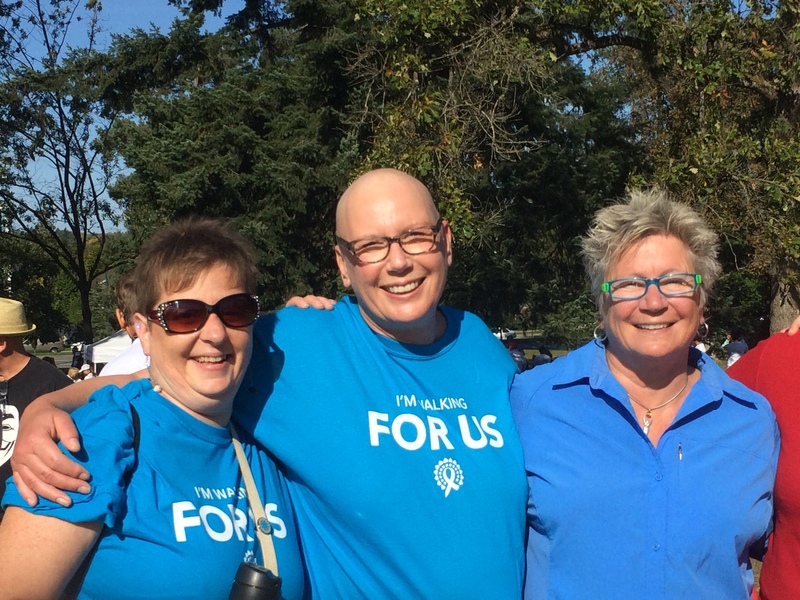 Walking for Us: Tammy and Rochelle, wearing teal shirts as ovarian cancer survivors; and my good friend Lorie. It’s my “cancer-versary” today and I’m proud and surprised to have made it this far. Five years ago I was diagnosed with advanced ovarian cancer. I wasn’t sure I was going to make it to Christmas. But it looks like I will see December again. How did I do it? Was it the exercise twice a week? All those supplements? Was it the prayers, love and support of many friends? Or Therese’s candles lit in cathedrals all over Europe? Was it five different lines of chemo? Was it the PARP clinical trial? (No, definitely not that). Was it my naturopath and Vitamin C infusions? I’m sure a sense of humour helps — especially black humour because sometimes you just have to laugh as we undergo these treatments to get rid of tumours. But first we have to endure baldness, blisters, swollen feet and hands or legs. We lose our balance and the ability to walk with elegance. Sores inhabit our mouths and make eating unpleasant. We’re all on this low fibre or “white” diet after years of worshiping steel-cut oats and kale smoothies. Now it’s white bread, white rice, not too much salad and peel that fruit. No nuts or grains or seeds. And there’s no promises that the chemo will work. Or that it will work for awhile until you’re back looking for the next weed-killer on the shelf. Until recently, only 30% of women diagnosed with ovarian cancer were still alive after five years. That’s a quick trip through the world of ovarian cancer. New data shows more women are surviving longer — 44.6%. I’ve had good news since I left the PARP inhibitor trial (ARIEL2). After two Taxol (paclitaxel) treatments, my CA 125 has dropped again — from 1,700 to 74. (Normal is 32 and under.) So incredible that my oncologist called me at home to tell me the news. And how am I feeling? Energetic. Back to exercise class. Swimming laps. Looking forward to a trip to the heat of Phoenix and later this fall, to Maui. I’ve come a long way from surgery five years ago when I was wheeled into recovery shouting, “Thank God for BC Hydro!”. It wasn’t electrical power I was concerned about — it was my kids who I was solely responsible for. 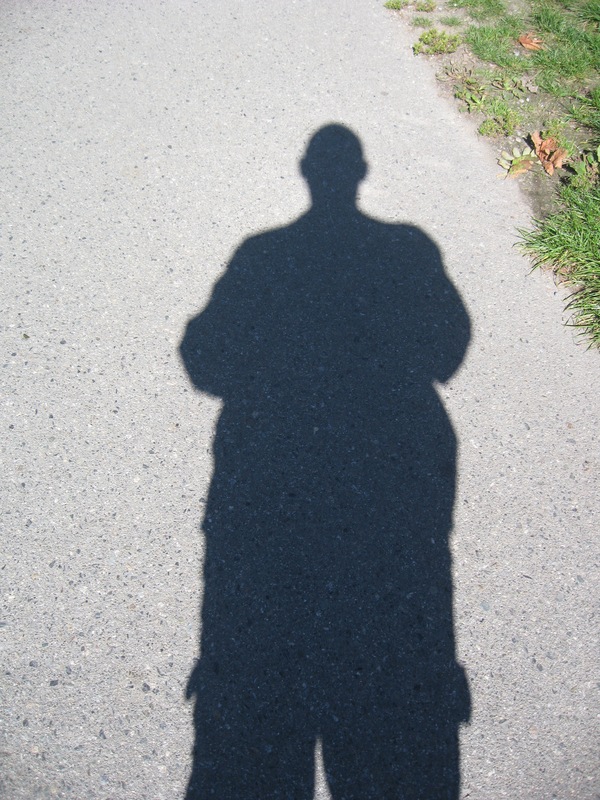 I worked for BC Hydro and its excellent health benefits and long term disability also supported my survival. 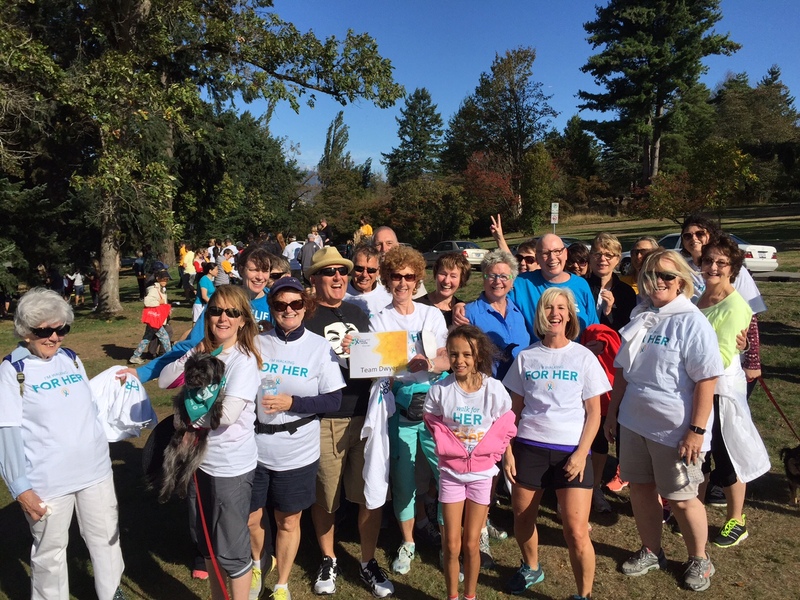 I joined other survivors on Sunday for The Walk of Hope after our Team Dwyer raised more than $11,700 from supporters far and wide. The national total raised is already more than $2 million. What is it for? Because it’s only through more research will we learn how to more survivors can live longer. In the meantime, creating awareness of the vague symptoms of this disease will encourage earlier diagnosis, treatment and survival. Okay, enough of the serious stuff… I’m off to celebrate my cancer-versary and to enjoy my life, as long as I can. Until next time. Team Dwyer, named for Shelagh Dwyer, my good friend and support buddy. Wishing her all the best as she battles health issues in hospital.